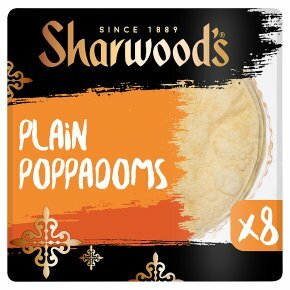 Irresistibly crispy poppadoms. Perfect with Sharwood's mango chutney. No artificial colours or preservatives. Suitable for vegetarians. Eat straight from the pack or serve warm. Just place them on a baking tray in a hot oven (180°C/350°F/Gas Mark 4) for two minutes and let the dipping begin!